For Penny Lee high school was a total nonevent. Her friends were okay, her grades were fine, and while she somehow managed to land a boyfriend, he doesn’t actually know anything about her. When Penny heads to college in Austin, Texas, to learn how to become a writer, it’s seventy nine miles and a zillion light years away from everything she can’t wait to leave behind. When Sam and Penny cross paths it’s less meet cute and more a collision of unbearable awkwardness. Still, they swap numbers and stay in touch via text and soon become digitally inseparable, sharing their deepest anxieties and secret dreams without the humiliating weirdness of having to see each other. Penelope Lee has aspirations of becoming an author, sharing adventures with captivated audiences. Embarking on her first year of college, Penny is spreading her wings as a young, independent woman and her nonexistent social standing. Her mother Celeste is a vibrant woman, single parent and although Penny often begrudges her mother for her affectionate and effervescent personality, is concerned Celeste will succumb to opportunists of the male persuasion, a point of contention believing her mother encourages male suitors. Penelope is a ambitious young woman although frustrating, intolerant and critical. Penny begins her journey on the threshold of her first year at college, reluctant to abandon her mother, anxious but determined to become an accomplished author. Penny believes her mother Celeste is irresponsible and effortlessly coerced, ridiculing her choice of attire and her demeanour as an affectionate, compassionate single woman. Her disregard for her mother was disappointing. A woman who raised her child to become an independent young woman, providing for her daughter and a wonderful encouragement. Once arriving at college, Penny ceases communication with Celeste. Penny is undoubtedly obnoxious but possesses a relatability that is confrontational and reflective. Sharing a dormitory room with Penny, Jude is a vivacious girl, her wealthy and ignorant friend Mallory is abrasive, as Penny despises commercialism and material possessions. Despite the dissimilarities, Jude is determined not to exclude Penny and encourages her socialise. Jude is a wonderful character of compassion and enthusiasm and although privileged, is considerate and nurturing. Sam Becker is despondent, his relationship fractured as he now resides in an intimate loft above his workplace, an Austin coffee house and patisserie. As a child, Sam endured a home of alcoholism and neglect, his mother a stern and resentful woman now estranged from her only child. Sam is a passionate, intense character yet wilfully ignorant, although his former girlfriend is unfaithful, Sam is prepared to absolve her of responsibility, a desperate young man moments from destruction. Uncharacteristic altruistic, Penny has volunteered to become the Emergency Contact and concerned by his behaviour, they begin messaging one another secretly, under the covers until the sun rises. Throughout their covert messages, Sam and Penny begin a tentative friendship, sharing their aspirations, thoughts and trepidation. Sam and Penny are undoubtedly attracted to one another but I appreciated the platonic friendship and Sam allowing Penny to determine the parameters of their friendship. The narrative also touches upon casual racism, poverty, socioeconomic barriers, privilege, alcohol abuse, pregnancy and sexual assault through a Korean American own voices narrative. The essence of Emergency Contact is a narrative of companionship, acceptance, maturing as individuals and learning from our experiences. A gentle, mature and beautiful contemporary romance, thoroughly enjoyed it. This review is part of the Simon and Schuster and Australian Young Adult Bloggers and readers group tour. You can follow the rest of the tour by clicking here. It is but foremost a friendship that develops into a romance, which is quite late in the read. I found Penny incredibly unlikable at the beginning but through her interactions with others and personal journey, I understood why she was so critical. It's very much a gentle contemporary that touches upon some important topics. I really enjoyed it overall. This one kinda threw me for a loop. I couldn't quite decide whether or not I like it, or even if I should. In the end, I think I gave in and decided to like it. Lol. I felt the same in the beginning too Joy, mainly because I found Penny really abrasive and unlikable. Having said that though, she's relatable as a character, the anxiety of leaving home but wanting to begin her life. I really liked Sam's character though and overall really enjoyed it. I loved that they were friends first and foremost too then all that romantic tension and neither knowing what to do with it. So much awkward but so lovely. Brilliant review, as always. I mean, I already had this on the old TBR but I may raise it up my to buy list because it really does sound like an enjoyable read. Although, Penny does sound like a bit of work to get along with but I'm thinking she sort of grows on you (I hope). I am still very excited to read. That she does actually. As unlikable as I found her in the beginning, I could see those traits I had in myself as a teen as well. Such a great read, diverse and wildly entertaining. wonderful review! The friendship dynamic in this story really appeals to me too. It's a very slow progression from friends to lovers but very much focused on the friendship. I'd love to see what you think of it Suzanne! This was an interesting review. I haven't read many (if any) that describe the various characters without touching on the story. But the themes you mentioned at the end of your review are important and a lot of people forget about these. Thank you! I try to talk about aspects of the books while allowing readers to discover the narrative themselves, nothing worse than spoiling a book is there. It touches on quite a few important issues and I couldn't agree more, so many white readers in particular tend to forget the marginalisation of people of colour until they're faced with a character experiencing microaggressions. I can't wait to see those shelves! It'll be so therapeutic to unbox them all and sort them. I hope you're settling in well, will try to catch up with you on Twitter sometime today to see how it's going! I'm glad you enjoyed this one. I've been hearing really good things. A friend of mine let me have her copy of the book so I really need to focus on reading that soon. Thanks for sharing!!! Really looking forward to seeing what you think of it Lauren, it's really a great read. #friends kind of story? It does sound pretty good. It's a great read Ailyn and wonderful Korean American representation too! This doesn't sound like my typical read but wow. This must have been an emotional read. It was Sam's narrative that I found quite emotional, just his displacement and even though he's in his very early twenties, he's still so young. It's a great read Amber, would love to see what you think of it! I think what wins me over with this is the platonic nature of their relationship. They obviously have so much going on aside from romance and I like that the author explored that and kept the romance at bay. Until the very end. It really explored how they begun to rely on one another emotionally and cognitively, sending messages and talking on the phone occasionally had taken the physical aspect out of the equation. I love romances that have bloomed from wonderful friendships and this was really lovely Verushka. I liked this one but not as much as you. I think some of the problem was it was pitched to me as a romance with commentary on the online dating culture and it wasn't really that. It's hard to get over expectations but this was a unique, interesting story with flawed but relatable characters. 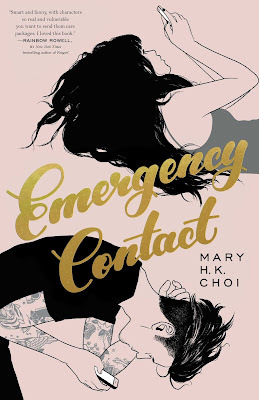 The synopsis really doesn't blend with the themes of Emergency Contact, it's much deeper than the cutesy, first world problems type romance. I liked it overall even though Penny irritated me quite a lot. Amazing review! I aspire to be as analytical and eloquent as you. I have to admit that this book was quite a let-down for me. It was pitched to me as an "own voices" novel but I could not see it in the novel.